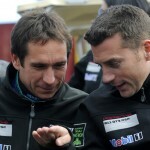 Porsche's hopes for a strong showing in California were drowned out on Friday when the qualifying round was rained out. Torrential rains forced the scheduled two hour and fifteen minute practice session to end after less than sixty minutes. The same rains came back later Friday evening just in time to cancel qualifying due to the conditions. As a result, starting positions were based on championship points vs. time on the track. On a circuit where room to pass is notoriously hard to find, Porsche's best teams started in 5th (Miller/Maassen), 6th (Neiman/Holzer), 8th (Henzler/Seller) and 10th (Bergmeister/Long), limiting their chances for success from the start. Under sunny skies on race day things looked much better when the green flag dropped onto a dry track. Even though Flying Lizard had no time get their Porsche set-up properly, Patrick Long gained six places during his stint to put the #45 car into fourth place. Unfortunately, the same bad luck that haunted Flying Lizard in Sebring was still present in Long Beach; this time in the form of a flat tire. Debris from a previous accident slashed Long's tire forcing him into the pits. Given how hard it is to pas on the Long Beach track, Patrick had no chances to get ahead and make up lost time. His Flying Lizard Porsche 911 GT3 RSR finally crossed the finish line in seventh place, followed by Sascha Maassen (Germany) and Bryce Miller (USA) in Paul Miller Racing’s 911. In the second Flying-Lizard racer, Porsche factory pilot Marco Holzer (Germany) secured ninth place with his teammate Seth Neiman (USA). Porsche's best finish came at the hands of factory driver Wolf Henzler in his team Falken Tire Porsche 911 GT3 RSR. Henzler's sixth place finish was the best Porsche could do given the conditions. Round three of the American Le Mans Series takes place on 12 May in Laguna Seca/California. How Much Money do you Get for Winning the 12 Hours of Sebring? Will the Auction for Whitney Houston’s Porsche Bring as Much Money as Beckham’s?